A View Of Ouscottah, From An Eadgah [with Sepoys]. bl.uk > Online Gallery Home	> Online exhibitions	> Asia, Pacific and Africa Collections	> A View Of Ouscottah, From An Eadgah [with Sepoys]. Plate twenty six from 'Picturesque Scenery in the Kingdom of Mysore' by James Hunter. This aquatint is based on a picture by Hunter depicting a mosque with sepoys and muslims standing in the foreground. During the latter half of the 18th Century, large areas of southern India were controlled by the kings of Mysore, Haider Ali Khan (c.1722 - 1782) and his son, Tipu Sultan (1753 -1799). 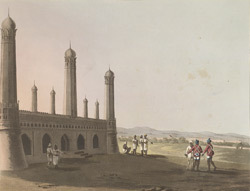 The bBritish waged four wars aagainst the Rajas of Mysore in the late Eighteenth Century. Hunter served as a Lieutenant in the Royal Artillery and his sketches portrayed aspects of military and everyday life.